Seems like every comics-related post you make I'm destined to show up and say, "Great job!" But this one was really cool. I've heard City of Glass is really good, so this makes me want to read it even more. 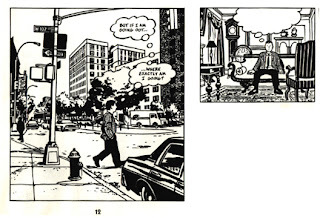 On a side note, you might be interested in my current posts about Will Eisner. 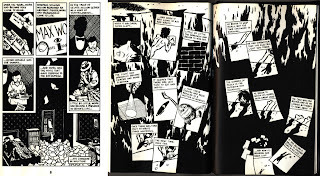 I've named this week Will Eisner Week on my blog, and I've been doing posts about his writing and art. I did one the other day on his page layouts, with examples and such. You might like it, since it seems kind of like what you're doing with this series, although I don't go into nearly as much detail. Any comments or criticisms you have would be much appreciated, but don't feel obligated. Matt, believe me, the positive feedback is much appreciated. And City of Glass is simply wonderful -- I can recommend without hesitation or caveat, unlike Cerebus. 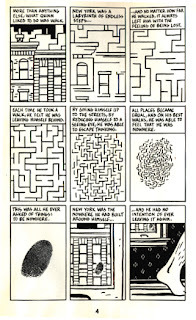 Everyone else: if you like this series, definitely do check out Matt's post on Eisner's layouts. Eisner was definitely on my list of artists to get to in this series, but Matt does a great job with it -- intimidating, but inspiring too. The rest of Matt's Eisner week series is worth a look too.